I’m a little bit sad because we’ve reached the third and final part of the ‘Discovering My Style’ series! If you haven’t had a chance to catch up with part 1 and 2 you can read them here ‘Discovering My Style #1’ and here ‘Discovering My Style #2- with Rokit Vintage’. This has been an amazing opportunity for me to try out a few different styles and ultimately have a lil’ experiment! The final outfit I wanted to include in this series, was a more casual everyday look. 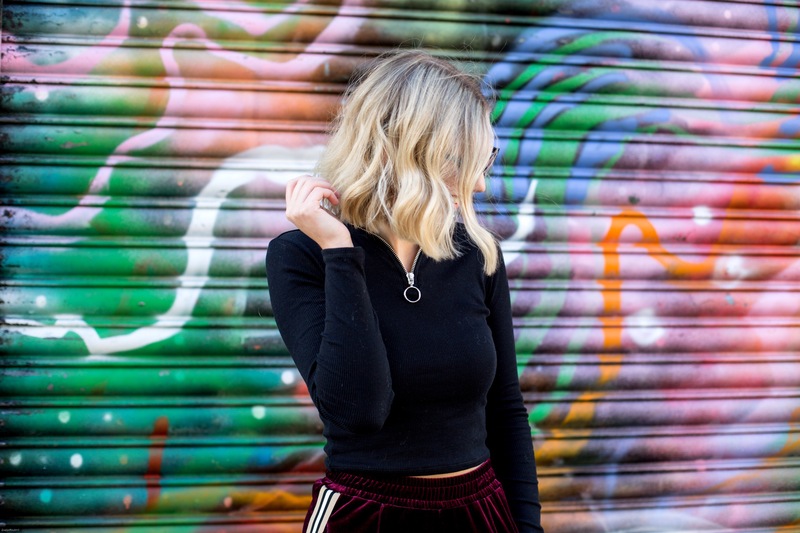 In a recent article, published on Boohoo.com, see here, my style was described as ‘think sports luxe with a wearable twist’ and this outfit is pretty much just that! When I’m not wearing the standard jeans and a t-shirt/jumper combo, I’m a big fan of a casual trouser. 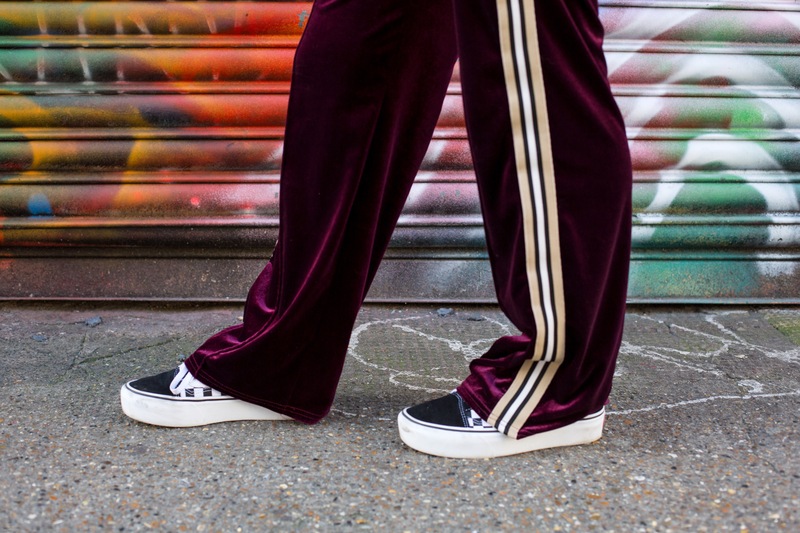 In the past I’ve often opted for a checked or striped pair, but recently I’ve been loving all of the straight leg velvet numbers. The black pair from Urban Outfitter’s which featured in my ‘Goodbye 2017, Hello 2018!’ post, have become my ultimate go-to for when I want to be comfy but still look presentable! Naturally, one pair just wasn’t enough, so I added a Burgundy pair to my collection. They have a stripe down the side which gives them that sports luxe edge, but they aren’t too ‘out there’ which makes them really wearable! To go with the trousers, which are the focal piece of this outfit, I bought a long sleeved black zip up top. This is a really easy piece to style and I knew I’d get a lot of wear with it, pairing it with other outfit combo’s such as mom jeans or a leather skirt. In relation to the sizing, I opted for an XS (6-8) to make it tight on the body, but this meant it was a little too tight around the neck for me, so I just unzipped it a bit! Overall, I think this is a nice inexpensive staple piece if you’re loving that sports luxe trend at the moment. I also paired this outfit with my high top checkered platform vans, just because, well, they’re amazing! I’ve been wearing them a lot lately and it’s safe to say they’re a firm favourite in my current trainer collection. Finally, I just want to talk about how amazing these cat eye sunglasses are. This a trend which is EVERYWHERE at the moment and you’re likely to see every Instagram girl and blogger sporting a pair this summer. But, if you’re not too sure whether or not the trend is for you, it’s understandable not to want to invest too much money in it. So, I’ve found the perfect pair, for a bargain price of £3.99, currently on offer on Ebay UK. Or if you’re just wanting to be money savvy, it makes sense to go for these ones, compared to similar styles being sold for £12 and upwards elsewhere! …and that’s it! The final outfit! Over this short series I wanted to communicate how it’s okay to experiment with clothes and most importantly it’s okay to change up your style. I’m discovering my ‘style’ all the time, it’s an everlasting process, but I think most importantly what I’ve discovered is that my style is me. It’s important not to compare too much and its important to focus on you. The phrase ‘you do you’ is springing to mind right now and its completely true! Take inspiration from around you, but ultimately wear what you want and what makes you feel happy. If that means one day you want to wear bright multi coloured clothes, but the next you want to wear all black, that’s absolutely fine. Don’t limit yourself because you feel like you need to stick to a particular style for that perfect Insta feed! Clothes are there to be experimented with! I can’t wait to continue bringing you more outfit posts and if there’s anything in particular you want to see from me, please leave a comment and let me know! It’s always great to get some feedback and direction. 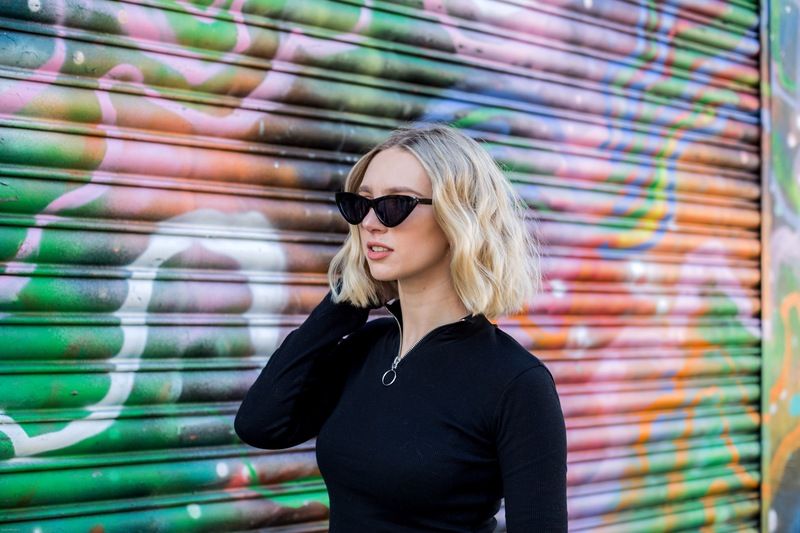 "HOW TO SWITCH OFF FROM SOCIAL MEDIA WITHOUT HAVING A FULL DETOX"
The cat eye glasses are my favourite! I also love velvet but my friends hate it when I wear it because they can’t stand the feel of it!